KROSSBREED is a Belgian band, formed in 2003. In 2007 the band came into sight with their second demo, “Enjoy The Rage” (2006). You can read my review here. This demo followed “Down To The Core” (2005). As you can imagine, the band played Groove Metal / Metalcore then. Two years later the EP “Carved In Stone” (2008) came out. See my review here. On this release, the band moved into a more Thrashy direction. But here as well, there were good ideas, but on a whole the band didn’t manage to convince me. In 2010 their debut full-length came out and was re-released by Casket Music in 2011: “3 Cheers For The Misery”. I have no knowledge about those songs, though. 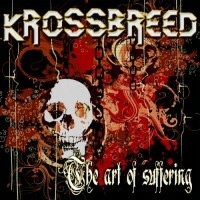 Now, since February 2013, KROSSBREED has released their second full-length and titled it “The Art Of Suffering”. And it has been a rough period prior to this release, as, for example, the band’s gear was stolen during a tour in the UK. Practically a year (February 2012) before the release of “The Art Of Suffering”. This new album contains twelve songs and a total playtime of more than 60 minutes. So be ready for an hour of ferocious and devastating Metal. “The Art Of Suffering” begins with a classical intro: the presence of the cello (and violin) gives it an APOCALYPTICA touch and reminded me a bit of the band’s first album, “Plays Metallica By Four Cellos” (1996). Inline with the album title, this intro is quite dark and dramatic. Metal soon takes over and shifts into fast groovy mode. The vocals are, as ever, aggressive. To counter the speed of the verses, the chorus is at midtempo, but allows for singing along. But the overall feel doesn’t add a ray of sunshine. There’s a bit of talking too and this piece is re-used later to link up with the chorus. Before that final step, however, there’s is room for a moment of leadwork and solos. This first track clocks in after the 7th minute marker. “A Dying King” comes to the front next with its groovy Metal, creating a tension of which you know that it will burst at some point. And when it does, it’s in a pounding way, yet with a good dose of melodicness. The aggressive verses roll onwards, while the chorus counters with melody and a clean voice. A clean break allows for a calm solo intermission. Growing in volume and sounding dark and dramatic, the chorus is not too far off, so the band can head towards the end. Tension is also found in “Fall From Grace”, which offers Thrash(ier) Metal and even blastbeats. Yes, the music is still aggressive, but the rhythm is very catchy. Michel screams his lungs out as if in agony (well, that alone indeed can be painful 😉 ), while the contrast is again found in the chorus (melody, clean singing). The intro theme returns and so does, of course, the verses. A rhythmic, groovy part leads to an outbreak, in the guise of a breakdown. Sort of. And the aforementioned blasting returns a little later. All is put to and end with the intro theme and one more round of Thrash. Any direct attacks? Yep, “As Clouds Gather” is definitely so. It’s aggressive, devastating and more of such things. On offer is melodic Thrash/Death Metal with pounding verses and a groovy, yet melodic chorus. It’s good that this sort of change is applied. Dual leads, albeit short, link up with a rocking bridge that links to another solo round before it’s back to business. And what do we have here? A ballad? The first tunes of “Lost Inside” certainly create that impression with the clean guitar lick and violin. But alas, no, as the doom of Metal erupts in a violent manner. All in its path is obliterated! Aggressive verses contrast with a more melodic, rocking chorus. Once the intro theme has returned, where is the Thrash? This sounds more like (fast) Power Metal that leads to the solo. Strange, but still trivial (the Power Metal-like twist). Another intro round is due to announce the last instrumental part (before the song is put to an end), that sounds rather mellow to me. Still, this song is quite alright. And so we come to another song where power and harshness are key: “Secrets”. Same recipe as before, but with that difference that the clean vocals in the chorus don’t really match/go well with the heavy guitars. A dark and evil bridge leads to the obligatory solo and so the end comes nearer. The guitar and bass “Defy Gravity” first before full-on pounding (and catchy) Metal sets in. While it’s not as fast as the previous tracks, the overall atmosphere remains dark and aggressive. Clean vocals and melodic guitar work reside again in the chorus, but it must be said that the clean singing before the chorus does sound/feel strange. Nice to hear is the MACHINE HEAD-like bridge. While “Lost Inside” wasn’t a ballad after all, “Disfigured” fills that void. It’s an acoustic track, for a while. Then the classic extreme outbreak is added, but that change wasn’t necessary. The acousticness was doing quite fine. Back to business then, despite this one real break. “Silver Lining” offers more of the aggressive, groovy Thrash Metal. However, I do think this is one of the more/most aggressive songs on the album. In “Razor Sharp” KROSSBREED brings back a bit of their Metalcore past, pounding in the verses, while melody is added to the Thrashy chorus. And if the contrast couldn’t be bigger: “What I Want To Know” is what you could call a straight-forward rocker, almost as if the band sold out (by manner of speech). 😉 But fear not, there’s enough screams and related in the chorus. All ends with “Between Pain And Pleasure”, where things start at midtempo to really kick in/break loose a little later. Again some Metalcore influences can be detected, though Michel and co. nicely mix it with Thrash. And his typical screamy vocal work. They collaborate with clean singing in the chorus. The song ends like MACHINE HEAD did it with “A Thousand Lies” (“Burn My Eyes” album, 1994): slower and slower. This is most likely KROSSBREED’s best release to date, as far as I can tell. The band headed into a more Thrashy direction, while keeping their Groove Metal intact. “The Art Of Suffering” contains good ideas and while it sounds better than their previous releases, I think the stage is where the music comes out best. There is also enough room for instrumental talk. However, if I may say so, the screams do tend to annoy after a while. These twelve tracks are, despite the one proper break, like one big ball of fury and anger (yes, there’s melody to soften this a little). Nothing wrong with this in itself, but I personally found it a little hard to sit through.